I’m not prone to melodrama. However, events at a marina in Georgetown, Bahamas, shaved at least a year off my life. Later, to an onlooker, I might have been seen laying on our trampolines looking relaxed and happy. But, you’re about to know differently. 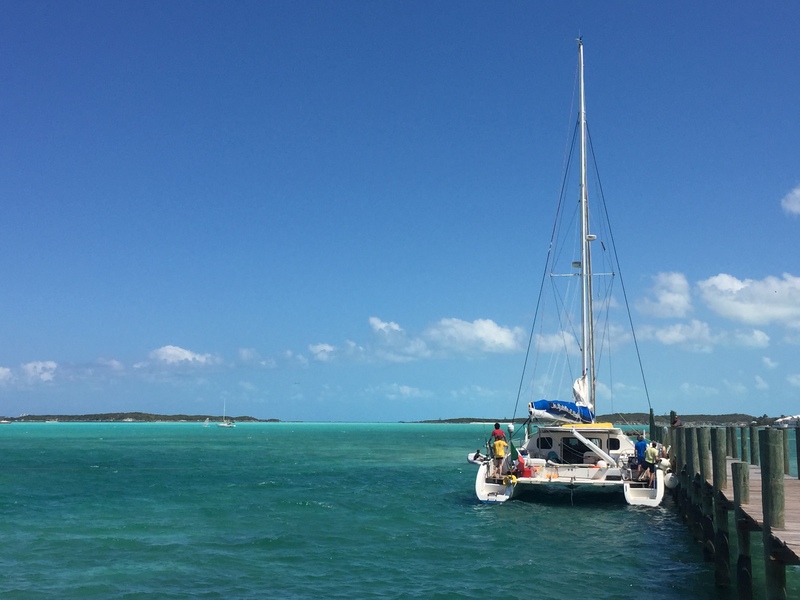 Our adventures began as we approached the fuel dock at the Exuma Yacht Club (EYC). Docking involves the fine art of using a lasso combined with the ability to steer, and confidence to maneuver without ramming the dock. At this point, you probably think we rammed the fuel dock. No. We had a hairy incident at the dock later. It was towards the tail-end of our calamities, after the incident that involved the use of a scalpel. But, I’ll get to that in a minute. We stayed for two nights at the Exuma Yacht Club. At first, tied across from the fuel dock, we were industrious. We enjoyed the perks of staying at a yacht club – proximity to shops, convenient garbage drop-off, access to hot showers and WiFi. 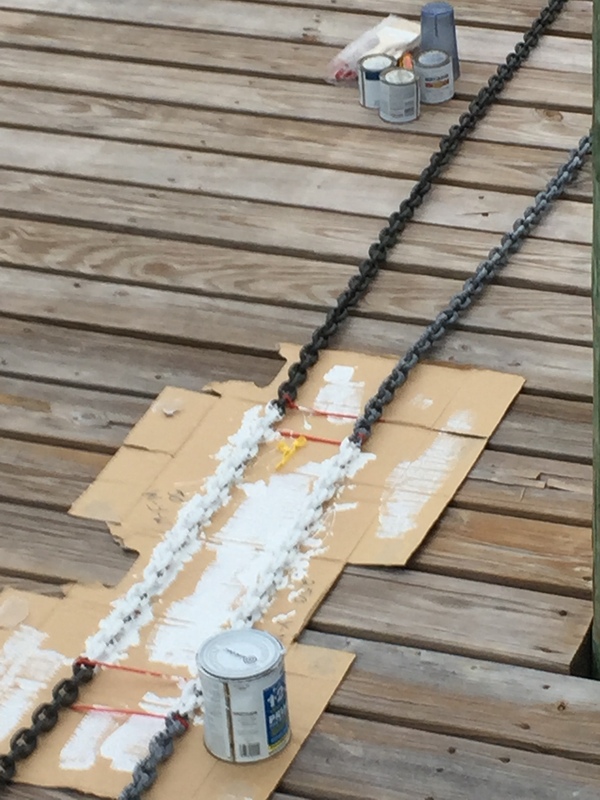 We used our time on the dock as an opportunity to paint our anchor chain. Applying primer to our chain in 25 foot increments. We painted the anchor chain to allow us to color code chain lengths. 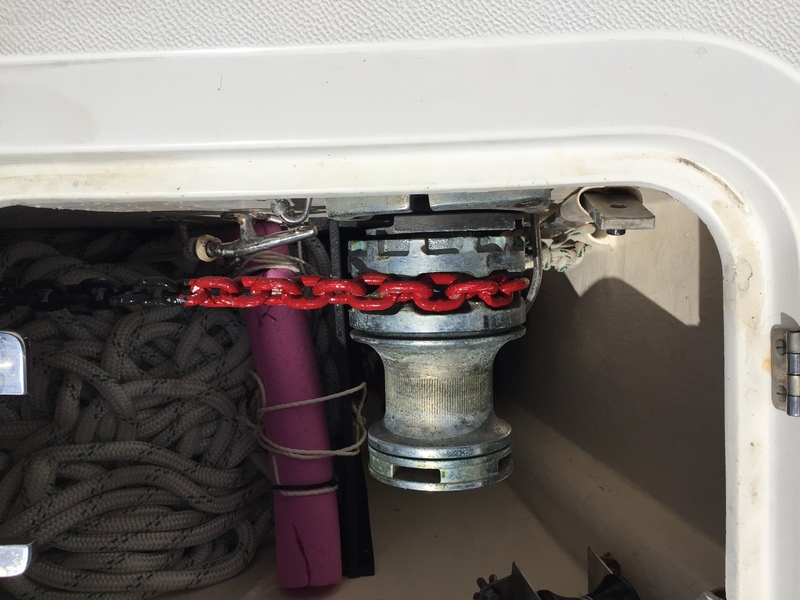 The article “How to Mark Readable Depth Marks on an Anchor Chain” explains the system we follow. Top view of our windlass mounted inside our anchor locker. The windlass feeds out the anchor chain and pulls it back in. Using the system described, red chain indicates 25 feet of chain. White and blue chain (not shown) indicate 50 feet and 75 feet, respectively. We also scrubbed the decks, and cleaned our engine compartments (being a catamaran we have two of them). Henry (age 4) is small enough that he could fit under the stairs at the back of our boat. He cleaned areas that haven’t seen the light of day since our boat was built. All of our kids enjoyed playing on a nearby beach. Things were going pretty well. Then, Betty sliced her thumb open while cutting a coconut. It was quite a mess with blood everywhere. We bandaged her thumb and had to clean the decks some more. With Betty in a bandage, Paul (age 8) agreed to buy some groceries. To do this, he had to cross a street, and walk to the Exuma Market, which is the grocery store here. Paul loved the responsibility, and his newfound sense of independence. We wanted to leave the dock earlier but could not. Here is a picture of our neighbour, “lo Spirito di Stella“, attempting to leave as the wind blew him onto the dock. They had a line running from the bow of their boat to a piling just outside the left edge of the picture. They were using that line on a winch in an attempt to pull the boat off the dock. Unfortunately, the wind was too strong and they had to abort their departure. The catamaran “Lo Spirito do Stella” attempts to leave the dock in strong winds. They ended up staying an extra night as it proved impossible. The boat in front of us was bursting with activity. And, in case anyone thinks they “can’t” sail – or like me, lacks both skills and confidence – you should know that the man at the helm – the skipper – uses a wheelchair and is a very accomplished sailor, and disability rights activist. His name is Andrea Stella. Working with his architect father, Stella designed the world’s first completely handicapped-accessible catamaran, lo Spirito di Stella. The 56-foot sailboat is the centerpiece of a nonprofit foundation, Spirit of Stella…that gives disabled people the opportunity to enjoy a day at sea for free. Over the last seven years, 5,000 disabled people and their friends have gone aboard and taken a sail. Stella’s catamaran is outfitted with two small wheeled seats that allow him to move forward and aft along the deck of each hup. Two elevator lifts allow him to move inside his boat. We said hello in passing. I would have loved to have talked to him more. Anyway, our neighbour left the dock early this morning. We hoped to follow soon after. As we got ready to depart a boat called “Oz” arrived to fill up on water. I helped them with their lines from shore, though it was more as a friendly gesture as they didn’t really need my help. As I learned later, the skipper of the boat, Toby, was a former captain of two defender boats. 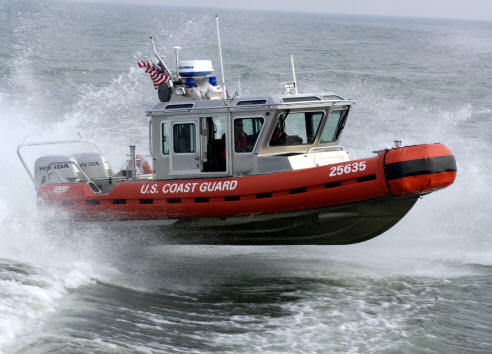 A defender boat is the sort driven by the US coast guard. Defender boat. Photo credit: http://glyde-ryde.com/install.htm. As I chatted with Toby and his family on the dock, little did I realize then that we would need their help much, much, more than they needed my help. Their guest from the San Francisco area (Mill Valley), Annie, later described their arrival and our attempt to depart as a case where the universe-was unfolding-as-it-should. As we left the dock to get fuel, Rick realized that we had no steering. How we came to have no steering is a discussion that lies somewhere in the dark realm of where spouses know best not to tread. All I know was that the hydraulic steering was working when we arrived at the dock. And, while we were at the dock, Rick detached the steering to inspect the manual rudder capabilities. Seems the bypass valves were opened in preparation to align the rudders, but with one thing leading to another, the alignment task got deferred and the valves were left open. The hydraulic steering was quickly fixed, but that matters not a hoot when you realize that you are drifting between a dock on one side while getting perilously close to someone else’s shiny white yacht on the other side. We needed to get back to the dock and tie our lines. Fortunately, Toby, his niece Annie, and one of her children came to assist. I threw them the lines and they helped us get back to the dock. Shortly thereafter, Rick disappeared into a stern locker and assured me that the steering was now working. Next up, was getting to the fuel dock. The winds were light. Rick steered with panache. This was the first time I can recall docking without first drawing a written plan. Because I’m new to sailing I like things to be explicit to minimize error. 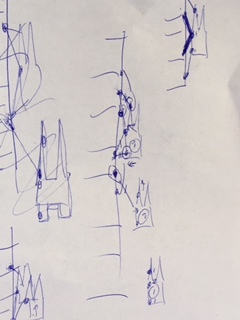 Here is an example of a written plan we used to dock at Cat Cay, when we checked in with our passports and vessel registration information to Bahamian customs. Early written plan for docking the SV Aphrodite. Anyway, as we were about to leave the fuel dock our son, Paul, lodged a splinter into his foot. He was not wearing shoes at the time. Earlier, our friend Dave warned us to wear shoes when we were on the dock. His own son once had a splinter that required a razor blade and tweezers to extract. In Paul’s case, Rick used a sterile, disposable scalpel, and we soaked his foot. I will spare you the details. It was not pretty. I was able to numb Paul’s splinter area with Anbesol – thanks to the advice I received from an EMT on a boat called “Copper Penny”. As soon as the splinter was out Paul felt no pain. But, I’m jumping ahead of myself. The splinter was removed about two hours after we left the fuel dock. Before that, Paul wouldn’t let me near his foot. Instead, what happened next played out like a bad dream. I couldn’t keep the boat off the dock, even with help from someone ashore. Rick steered to move away from the dock but the wind would blow us right back. As he accelerated I almost fell off the back of the boat. Our rear fenders struggled under the force of the boat being pushed into the dock. Wayward conch shells flew off our barbecue as our fenders knocked them off. Later, I came to be laying on our trampolines with my head resting on a fender. Meanwhile Rick was eating a bowl of curry, sitting on the bow seat watching our anchor set. Surrounded by clear waters, and white sands, on the surface, we may have cut a picture of bliss. But all was not as it seemed. And, as our children watched a Christmas movie inside our boat (it is April), Paul soaked his foot in a bucket.